This summer was so hot in Marmaris it was unbelievable. There is nothing tastier that a cold salad for dinner when it is hot and sweaty out. I love this salad. It is tasty and easy and has that yummy roasted flavor. P.S. Please excuse the quality of the photo, and the appearance of the salad. I was on vacation and took the photo with my phone, and the kitchen at the summer house is kind of like camping, one knife, four plates, a pot and a sauce pan. This was so good, I wish I had made double the amount. The good news is that it is seriously easy to make and it tastes just as good (well, better) than take out Garlic Shrimp. I only made two servings, but I had leftover sauce, so I'm writing down the sauce recipe as I made it and doubling the shrimp and veggies to make four servings total. To make the sauce, mince up three large cloves of garlic. In a small pan, melt butter. Add the garlic. Add flour and whisk until the butter is absorbed into the flour. Pour in the can of coconut milk. (If you've never used canned coconut milk before, the solids will have floated to the top, so it won't look liquid. Pour the solid and the liquid part into the pan and it will melt fast enough.) Add salt to taste. Bring to a simmer until sauce thickens a bit. Turn off heat and set aside. In a large skillet coated with oil, saute mushrooms, sugar snap peas and rinsed and drained baby corn. When the vegetables are tender, remove to a bowl. Add shrimp and cook until almost done. Add vegetables back in and pour over sauce. Serve with brown rice. Whisk all the ingredients for the fish marinade together and set fish in it to marinade for about 1 hour. Drain marinade away from fish. Cook in a very hot skillet until fish can be easily flaked with a fork. To make coleslaw, mix the yogurt, honey, mustard, olive oil and salt & pepper. Cut the cabbage into very small pieces and add the grated carrot. Pour sauce on top and let sit for an hour. Built taco with tortilla, coleslaw and fish. I also added a bit of diced raw red onion on top. I served with oven fries and cantaloupe on the side. A few days ago I made Taco Mini Muffins. When I made the meal, I doubled the taco meat & veggie mixture for a meal later in the week. That was tonight. I turned the taco meat into Tex-Mex Stuffed Bell Peppers, and they were very delicious! I served them alongside a simple fruit salad with a yogurt dressing. 1 recipe of the taco meat & veggie mixture from my Taco Mini Muffins. In a small pot, bring stock to a boil. Add couscous and stir. Turn off heat, cover and let sit for 5 minutes. Add couscous to taco meat mixture and stir. Cut the tops off your bell peppers. If the bottoms are very crooked, you may want to cut of a very small amount to make them level so they will stand up. Stuff each bell pepper with 1/4 of the taco/couscous mixture. Place them on a cookie sheet and bake at 425 for 30 minutes. Top each bell pepper with some of the grated cheese and broil until cheese is melted. Serves 4. Peel and chop banana. Peel and segment one orange and cut each slice in half. Cut strawberries into fourths. Cut grapes in half. Place all fruit into a mixing bowl. In another small bowl, mix the yogurt, vanilla, honey, cinnamon and ginger. Pour over fruit. Serve chilled. I made Shrimp and Spinach Lasagna tonight for dinner. I wish I could share the recipe but again, I didn't measure. It was really good though. Basically I made a simple bechamel sauce with butter, wheat flour and milk. Then I whisked in half a block of mozzarella. I added half a package of frozen (drained) spinach. I bought pre-made whole wheat oven ready noodles and layered the noodles, with the spinach sauce, shrimp and cottage cheese (I prefer it over ricotta.) I topped it with the second half of mozzarella and baked covered for 30 minutes and uncovered for 15.Sorry, not much help tonight!! I loved the response from my homemade chicken nuggets! Many of my friends told me they were going to try out the recipe. Please let me know how yours turn out if you do! Today's recipe is another very toddler friendly meal idea. Although I'm going to serve this for dinner for the adults too, paired with a salad. These Taco Mini Muffins can also be made in bulk and frozen. Reheat in the toaster oven or microwave. This isn't an exact science, you can change the recipe to your preferences. Oh and I actually doubled the meat and veggies so I could have easy taco salads later this week. approx 2 cups of milk, start with slightly less and add until you get a "pancake" batter consistency. Once vegetables have been removed from the skillet, add the meat. Add the cumin, chili powder, oregano, tomato paste or ketchup, salt and pepper. Cook on medium-high heat until meat is cooked all the way through. Add meat to the vegetables and stir. In a large bowl, mix all the ingredients for the cornbread mix, except the milk. Add 1 1/2 cups of milk and stir. Add enough milk until you have a loose "pancake" like batter. Stir in the meat/vegetable mixture. Dish about 2 tbsp in mini muffin tins. Bake at 375 for 12 minutes. If you do larger muffins, adjust your cooking time. A toothpick should come out clean and the tops of the muffins should start to brown. Put the entire 1/2 gallon of milk in your crockpot. Set to low. Cook for 2.5 hours. Keep covered, but unplug to let milk cool, about 3 hours. 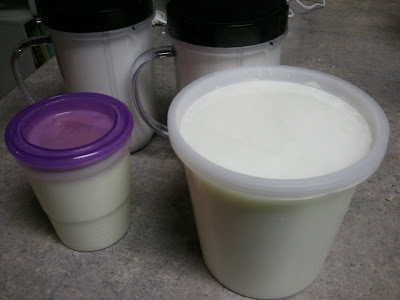 In a small bowl mix two cups of warmish milk from your crockpot with 1/2 cup of real yogurt. Add back to crockpot and stir. Cover with entire crockpot with a bath towel to keep insulated, but keep the power off. Let sit for 8 hours. Open lid to a wonderful surprise! Yogurt! I've done versions of this before, but everytime I do something I do it a bit differently. This is what I did this time. I made up a batch and like usual will freeze it on the cookie sheet over night. Then I take the frozen nuggets and place in a freezer bag and just reheat a few at at time for lunches for my girls. They have the texture of "McNuggets" that kids like, but somehow I don't think the McNuggets have carrot grated up in theirs! Serve it with homemade ketchup and your kids are in for a tasty treat! Place chicken in food processor with grated carrot and oil. Pulse then add egg. Pulse until well ground up. This is what the chicken/carrot mixture looks like. Scoop into little balls and roll in breadcrumbs. Makes about 3 dozen nuggets. Cut chicken thighs into 1-2 inch pieces. Put them in a food processor. Grate one carrot and put it in the food processor with the chicken. Add the flaxseed oil. Pulse until the chicken is ground up. Add one egg and pulse until it is incorporated. Dump the chicken mixture into a mixing bowl. Place bread crumbs in a shallow dish and mix in the italian seasonings. Using a one tablespoon scoop, scoop out the chicken mixture into little balls. Roll in the breadcrumbs and place on a sprayed cookie sheet (or parchment paper.) Flatten the balls and shape into little ovals. Spray the tops of each nugget. Bake at 375 for 18 minutes. Makes about 3 dozen nuggets. I tried quinoa (pronounced keen-wa) for the (second) time tonight. The first time was a disaster, I completely over cooked it and it was horrid. Tonight, I vote it was great, John did not like it and the girls ate about half of their serving. For those who have never heard of quinoa, it is a very healthy "grain." It's more like a seed and is actually related to beets and spinach. Which is why it is go good for you. It's very high in fiber and protein. For more information on it, read this wiki page. 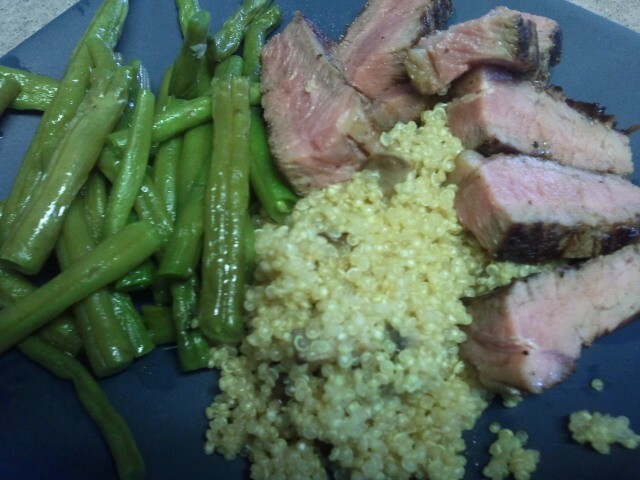 I served the quinoa with a grilled steak and fresh greenbeans. Our salad kick has continued with this ham and fruit tossed salad. It's been fun stepping out of our "normal" routine and trying some new dishes. And let me tell you, with the weather peaking at 104-105 degrees these days a nice cool salad is perfect for dinner! I got this recipe from Salads by Carrie Holcomb . Take the zest off one orange and set it aside. Peel and segment two of the oranges. Set the orange segments aside. Make dressing by mixing together cream cheese, sugar, orange zest and enough of the juice from one orange to make the dressing a drizzling consistancy. In a large bowl, combine lettuce, spinach, ham, grapes, spicy nuts and orange segments. Toss lightly to mix. Pour dressing over lettuce mixture and toss to coat. Divide amount four salad plates. Combine nuts, butter, red pepper, cumin and salt. Spread on a single layer in a shallow baking pan. Bake in a 350 degree oven for about 10 minutes, stirring once. To store, place in an airtight container and refrigerate for up to 1 month. Break to room temperature before serving. As most of you already know, I'm on a processed free kick. The more reading I'm doing the more I've come to realize how many chemicals we eat every day and it is pretty scary. But cooking homemade from scratch cooking doesn't always have to be time intensive! I'm also trying to eat more veggies and less carbs and a lot of times carbs are what takes the longest in a meal to cook. This dinner took only 15 minutes to assemble. The tomatoes cooked in the oven on low heat for 2 hours, but you could do them quicker if needed by broiling instead of slow roasting. Pound chicken breast out so it is even, season with salt and pepper. Pre-heat your indoor grill skillet to very hot. Cook chicken about 4 minutes on each side. Let rest before slicing. Assemble: place spinach leaves on plate, top with chicken and tomato sauce. Sprinkle on a bit of parmesan cheese and enjoy! I served with another side of veggies to be carb free, but this would of course be great with pasta! I decided to make a salad for dinner. Usually when I do this it is a last minute meal thrown together with ingredients from my refridgerator. So grilled chicken with carrots, cucumber over iceberg lettuce is our usual "main dish" salad of choice. But I found this salad in a cookbook, appropriately named "SALADS " by Carrie Holcomb. I set out with a grocery list and a plan. This was a very good salad. My husband who said he doesn't like Greek food even liked it! That's a win! Place steak under broiler 3 inches from heat for 6 minutes. Turn steak. Broil to desired doness (6-8 minutes for medium.) Cool slightly. Cut into thin slices. Place meat in a deep bowl along with artichoke hearts, onion, olive, bell pepper and tomatoes. Make the marinade: whisk in a medium bowl, oil, vinegar, lemon juice, oregano, anchovy paste, pepper, grated garlic. Pour marinade over meat mixture. Cover and marinate in the refrigerator for 6-24 hours, stirring occasionally. In a large mixing bowl, combine lettuce and spinach. Top with meat mixture. Sprinkle with feta cheese.